Clare Benton, a 36 year old single mother who suffers with depression is well on her way back to the workplace and her mental health's improved thanks to Links to Work support. Clare left her previous job when depression took hold following a couple of family bereavements. 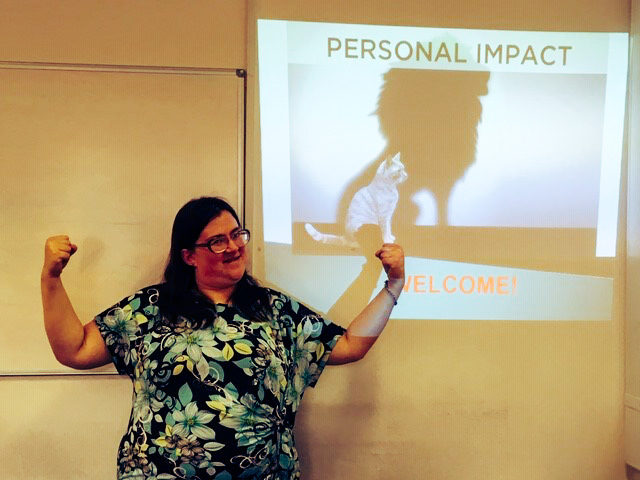 After a while out of work Clare made the brave decision to enrol on our Personal Impact skills course determined to get her life back on track. Clare said: "I decided to come on the course as I was feeling depressed and lonely." Course tutor, Amy Butler, supported Clare to achieve her City & Guilds Level 1 Award for Employability Skills, a nationally recognised qualification and one of the perks of completing the Personal Impact course. The course equips participants with the skills to make a bigger impact when it comes to the job application process and build their confidence in the process. Clare said: "I am determined to improve my situation. Try stopping me, I am unstoppable." Clare was so encouraged by the course she was keen to sign up for another and equip herself with more skills for the workplace. She joined the SFEDI accredited Developing Personal Power course. A course designed to build confidence by tackling topics such as stress management, developing resilience and discovering your strengths. Clare said: "My writing has become better and my confidence is now excellent. I would encourage anyone to join the courses as it would benefit them and they get really good qualifications at the end." The courses have helped Clare gain the confidence to start looking for employment opportunities. She's looking for work in retail and currently attending our City and Guilds accredited Customer Service course to support this. Clare really feels that the Links to Work support has helped her turn her life around – professionally and personally. She said: "I have made new friends since doing the course, friends I plan to stay in touch with." "I feel good about my future, things are looking up." Find out more about our skills courses available for our Nottingham customers on our accredited training pages. We can help you too. Sign up for our free employment support and we'll work with you to overcome your barriers and get you the job you want.